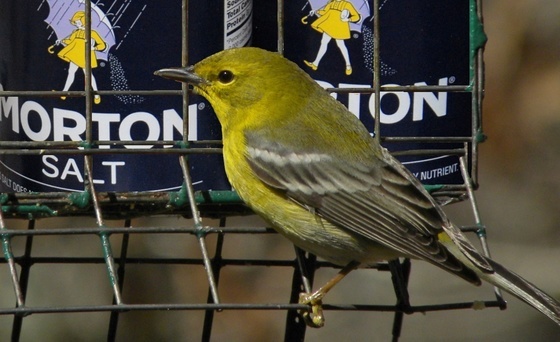 Out my backdoor: Does salt harm birds? If you made a health-related New Year's resolution, chances are it involved eating less salt. The harmful effects of a high-salt diet on humans are well documented. But is the same true for the birds that visit our feeders? Read the rest of Terry’s column for a deeper look at the issue, including details on natural and man-made sources of salt for wildlife. Jessica McGuire and Tina Johannsen are leaders in the office and in the field for DNR's Wildlife Resources Division. McGuire manages the Private Lands Program. Johannsen is program operations manager for the division’s Game Management Section. Their perspectives as women on the front lines of wildlife management are explored in this Theodore Roosevelt Conservation Partnership blog post, part of a Women Conservationist Wednesday series. 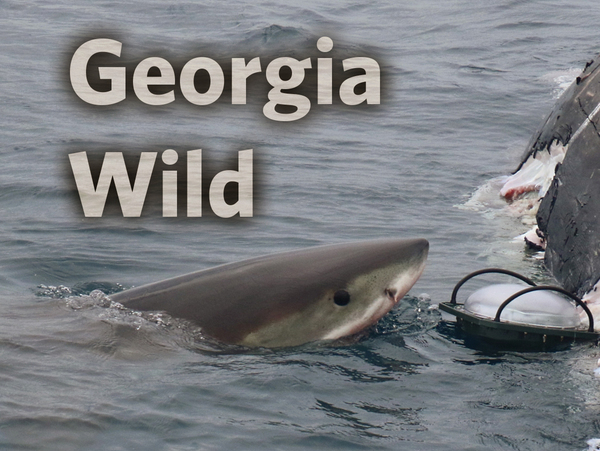 It’s not news that great white sharks cruise the depths off Georgia’s coast. But recent video and photos of large sharks including great whites (one estimated at 12 feet long) scavenging a whale carcass about 30 miles off Cumberland Island are fascinating. And the speed at which the predators transformed the dead humpback into only flippers and blubbery tissue is amazing. Watch the video George shot and produced in partnership with the Florida Fish and Wildlife Conservation Commission, Sea to Shore Alliance and NOAA. The domed device shown in some clips is a satellite tracking buoy that Florida Fish and Wildlife Conservation Commission scientists attached when they found the carcass. 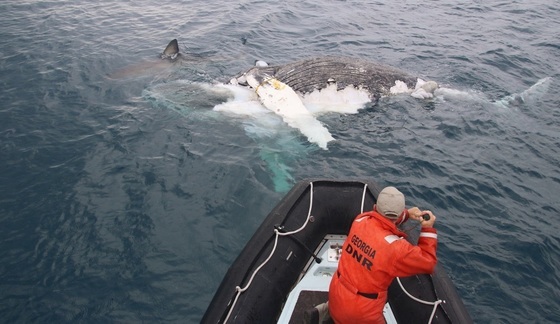 Researchers hoped to determine how the humpback died but couldn’t because the carcass had been so ravaged by sharks. The yearling humpback was spotted entangled in commercial fishing net off Massachusetts this summer. It was later seen alive but in poor condition off Georgia and Florida this winter, including only four days before it was found dead. Because of the state of the carcass, it’s unclear if the whale was still entangled in fishing gear when it died. 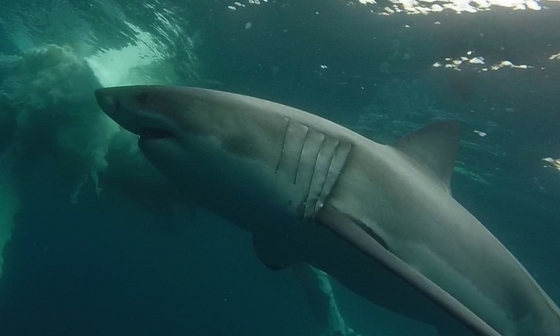 Senior biologist Clay George attached a GoPro to a pole to video the sharks and the humpback underwater. In the next e-news: Humpbacks are becoming more common in the Southeast. Want to know how to conserve two birds with one contribution, so to speak? No matter the amount, all donations will support research, surveys, management and education to restore and protect Georgia’s animal and plant species now and for your children and grandchildren. That’s the first bird. The second? All contributions will help stem a concerning decline in Wildlife Conservation Fund checkoff support. Historically, the checkoff has averaged about 10 percent of fund revenues each year. Yet the past two years those donations have slipped to all-time lows. Last year’s $113,606 marked a 53-percent drop from 2015 and made up only 4 percent of fund revenues. Remember, Georgia’s Nongame Wildlife Conservation Fund is dedicated by state law to conserving rare and other wildlife that aren’t legally fished for or hunted. Without a robust fund, DNR’s Nongame Conservation Section, which depends largely on grants, contributions and fundraising, cannot do its job. Make the most of your conservation support: Give through the wildlife checkoff. Action at the osprey nest live-streamed from The Landings near Savannah has heated up. The adults are incubating three eggs, all laid this month. Incubation can take from 36-42 days, according to the Cornell Lab of Ornithology, which shares video of the nest, along with The Landings and Georgia DNR. 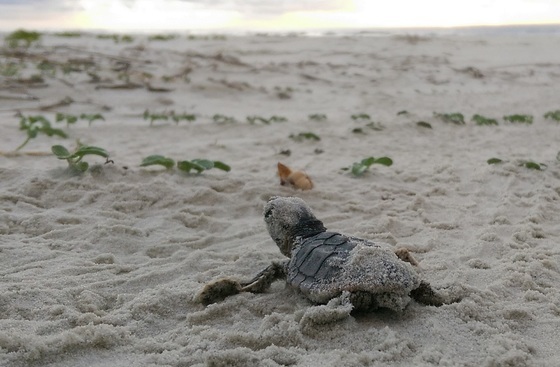 Cold snaps that stunned sea turtles by the thousands had DNR Sea Turtle Program Coordinator Mark Dodd on the move. Dodd helped rehab and release turtles Jan. 3-4 in Florida and, in answer to a request from the National Marine Fisheries Service, Jan. 17-19 on South Padre Island in Texas. Black bear sightings in Georgia increase each spring as hungry bears emerge from their winter den sites. But DNR offices are already fielding calls about bears this year, prompting this reminder of what to do and not to do. Wildlife-viewing projects from Athens to Colquitt and Atlanta to Brunswick will receive grants to improve public opportunities to see and learn about animals, plants and natural habitats considered conservation priorities in Georgia’s State Wildlife Action Plan. DNR announced six projects last week as 2018 recipients of the Wildlife Viewing Grants Program. The Georgia Outdoor Stewardship Act (House Bill 332) and House Resolution 238, companion legislation to hold a voter referendum on the act this fall, passed the House Feb. 28. Aimed at dedicating a percentage of state sales taxes to protect and manage conservation lands, both are in the Senate Appropriations Committee. 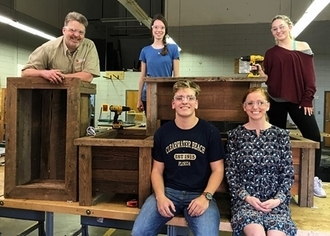 DNR botanist Dr. J. Mincy Moffett Jr. recently worked with the Oconee County High School Environmental Club – which includes his daughter Harper Ann – to build wooden planters for the State Botanical Garden of Georgia’s Connect-to-Protect program. The planters will be installed at elementary schools in Oconee and used to grow native plants that attract and support pollinators, part of a long-term effort to help link Connect-to-Protect with the county's elementary and middle schools, and beyond. It’s not too early to sign up for summer camp at Charlie Elliott Wildlife Center. Registration is open and while Charlie Elliott offers a deep lineup of nature-oriented camps, from day sessions to overnighters, the camps will fill fast. Names in the news: The Covington-Newton County Chamber of Commerce presented the county’s top community service award, the R.O. Arnold Award, to David and Connie Waller. Organizers cited the Newton couple’s work, including Connie’s 28 years as director of Keep Covington-Newton County Beautiful and David’s role in helping found Charlie Elliott Wildlife Center (as a former Wildlife Resources Division director) and develop a county plan for hiking and biking trails. 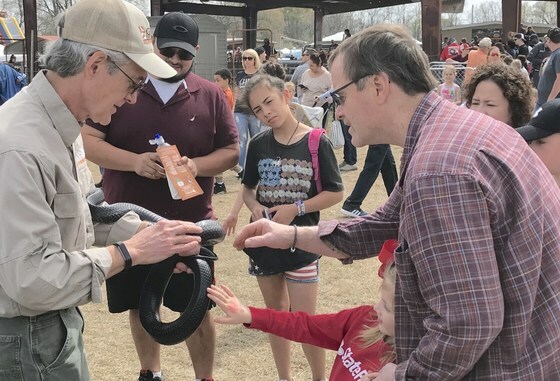 Nongame Conservation Section Chief Jon Ambrose shows an eastern indigo snake to visitors at the Claxton Rattlesnake and Wildlife Festival Saturday. The 51-year-old Evans County Wildlife Club event continues to draw crowds since abandoning a rattlesnake roundup format – including buying and selling wild-caught rattlers – in 2012 and emphasizing wildlife conservation and education, including native reptiles such as the federally threatened eastern indigo. Another former roundup, Fitzgerald’s Wild Chicken Festival, “struts its stuff” this weekend.